Hair Growth Serum: It takes 4 months to see the full effects of this serum, however I noticed initial results after 6 weeks. I apply 20 drops to my scalp at night and massage in thoroughly. It doesn't leave my hair greasy so I guess you could use it in the morning, but for me it is part of my nightly routine. I have been doing this once a year for the last 3 years and it really helps with hair growth, which means I see a lot more of my hairdresser as my roots show more quickly! The next time that I repurchase, I will get the Intense version as that not only helps with hair growth in terms of length, but also in terms of density, which I would love to achieve as prior to becoming ill, I had lots of volume in my hair. Hair Density Nutrients: These supplements contain a high dose of Biotin, Hyaluronic Acid and Amino Acids, all of which combine to strengthen the hair and encourage growth. I recently finished a 40 day supply and even my hairdresser could see a difference in my hair in terms of condition, density and length. These aren't pictured as I recently finished them and need to re-order! 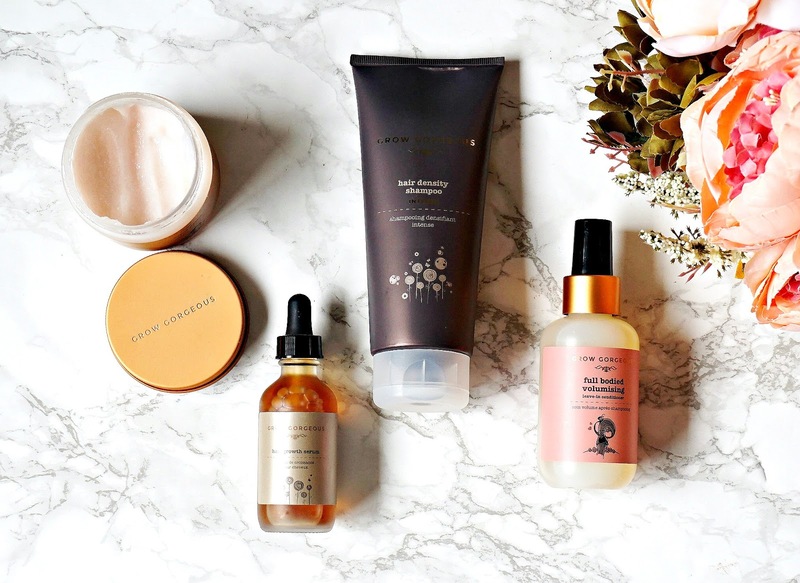 Scalp Detox: This has been a revelation for me this year! I exfoliate my face and body so why has it never occurred to me before I was introduced to this product, to exfoliate my scalp?! I can't be the only one? Before I tried this, I was afraid that I wouldn't be able to rinse it properly but that isn't a problem at all. I wet my hair and then apply this all over my scalp and massage it in thoroughly, before leaving it to work for a few minutes. It contains Pomegranate Fruit Enzymes, Natural Caster Oil Beads and White Willow Bead Extracts, all of which exfoliate any dead skin on my scalp and it rinses thoroughly to leave my head feeling cool and soothed. I am now on my second pot of this product and I haven't had an itchy or tight scalp since I started using it. Hair Density Shampoo: I have tried two shampoos from the brand and this is definitely my favourite. This shampoo leaves my hair looking and feeling like it has multiplied. It doesn't just add volume at the roots, but improves the overall density and I can really tell the difference when I try to put my hair in a ponytail or in a hair grip as there is just so much more of it. Its ingredients list includes Caffeine (which stimulates the roots), Biotin (which encourages hair growth) and Niacin (which encourages cellular repair). It is quite thick in texture but rinses easily and doesn't weigh the hair down. My hair has more movement and "body" when I use this shampoo. As with all other Grow Gorgeous products, this shampoo has a beautiful scent - like perfume for your hair! Full Bodied Volumising Leave-in Conditioner: This is one of the latest releases from Grow Gorgeous and, for me, it doesn't replace a traditional wash out conditioner as my hair is so dry that I need something more intense. However, I use this on wet hair before I detangle it and go on to style my hair and the shine it gives my hair is intense! It also leaves my hair very bouncy, which I love. It contains Pea Peptides (which act as a film on each strand of hair), Amino Acids (which encourage cellular renewal) and Pea Derived Proteins (which condition the hair fibres). It doesn't weigh the hair down or make it greasy so I would highly recommend it if your hair is looking and feeling a little lacklustre. I love the results that I have achieved with the use of these products - my hair is stronger, longer and healthier overall. Have you tried anything from this brand? I'd love to hear your favourites! All products are bought by me, unless otherwise stated. Most of these products were kindly sent to me, however I have repurchased the Grow Gorgeous Serum several times myself. This post is not sponsored. Opinion is always my own.